I have been single my whole life. It’s just another one of those facts about me, but it also makes up a large part of my identity. Media mostly shows us couples like these, but what about all of the long-term single people? Most of the time I’m content with it, but for a long time I felt like the only one whose always been single (I’ve written about my singleness here: Single Is All I Know). Then I started this blog. I’ve had so many people reach out to me telling me that they too have only ever been single, or are long term single. Many of these people were also in their 20s or 30s, and some saying this had only changed for them even later in life. So why did I feel like the only one? Society and media gave me the impression that people spend more time in relationships than single. With such a focus on dating this kind of makes sense. The majority of single people are aiming to be in a relationship, aiming to spend less time single than coupled. I understand this, but it’s not everyone’s truth. Even those who are aiming to be in a relationship spend a lot of time single, much more than you may think in fact. Since beginning this blog I’ve spoken with a lot of people who are single, many of which are in the dating scene. I was interested to know the longest amount of time individuals had been single for. What would your prediction be? In my media led view of the world, where all the characters on my screen and pages all find love quickly, I didn’t think most people were single for that long. I thought being long term single was the anomaly. I was surprised by how wrong I was. I did a little twitter poll to investigate. It wasn’t exactly the biggest sample but the results are still very interesting. 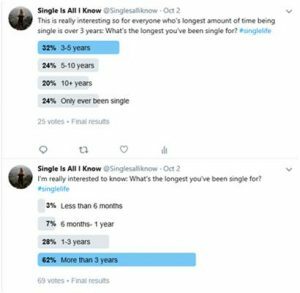 Twitter Poll of the longest time people have been single for. As you can see, at first my categories only went up to a maximum of 3 years. When I started to see how many people chose this (and a number of messages about it) I added the second poll with larger lengths of time being single. It suggests that it’s not unusual for people to be single for over 3 years at some point in their lives. And it’s also not that rare for people to have been single much longer, or like me, have only ever been single. This surprised me, even though it’s what I live. So why was it surprising? Because we don’t talk about it? Because we don’t see it? Both? Lots of us probably do know people who have been single a long time, but it’s unlikely we ask about it or know the full details. I guess it’s easy for us to be oblivious of the singleness around us. But if we don’t acknowledge it as normal, not only is it harmful to those people for whom it is normal, but it also means long term single people are under represented. I am still waiting to see a celebrity who is ‘permanently single’ (as I like to call a non dating/searching single person), or a character on my screen or in a book I read that never has any storyline involving love/romance. I think we deserve one. Long term single people exist. As much as people in relationships or people dating. We exist. We’re not unicorns. Everyone needs to be reminded that it is ok to be single and that there is nothing wrong with us. We are not alone and we’re not even rare. Interesting article. I’ve only ever been single too.